For the Zachary Cale album, see Blue Rider (album). 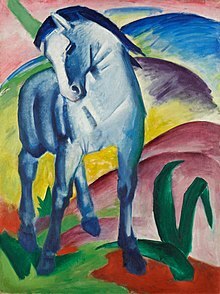 Der Blaue Reiter was an art movement lasting from 1911 to 1914, fundamental to Expressionism, along with Die Brücke which was founded in 1905. Wassily Kandinsky, Franz Marc, August Macke, Alexej von Jawlensky, Marianne von Werefkin, Gabriele Münter, Lyonel Feininger, Albert Bloch and others formed the group in response to the rejection of Kandinsky's painting Last Judgment from an exhibition. Der Blaue Reiter lacked an artistic manifesto, but it was centered on Kandinsky and Marc. Paul Klee was also involved. Supported by their dealer Galka Scheyer, Kandinsky, Feininger, Klee and Alexej von Jawlensky formed Die Blaue Vier (the Blue Four) group in 1923. Together they exhibited and lectured in the United States from 1924.